September, 2001 / Captain W. Russell Webster / Comments Off on The next disaster : Ready to respond? If a large commercial airplane plummeted into the sea today, would your agency be prepared to respond effectively, efficiently, and compassionately? 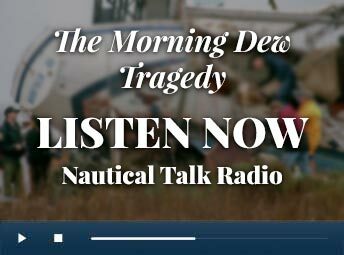 It can be if you follow the prior planning and lessons learned from the New England Coast Guard commands that directed major portions of at-sea operations during both the JFK Jr. and EgyptAir Flight 990 recovery operations. John F. Kennedy Jr.’s small private airplane (N9253) with three people on board went down about seven miles southwest of Martha’s Vineyard around 2145 on 16 July 1999. The weather that night was typical for Cape Cod– hazy, a four-foot ocean swell, and a 15-knot southwesterly breeze. At 0155 on 17 July 1999, a Kennedy family friend reported the plane overdue to the Coast Guard Group Woods Hole operations center. The Coast Guard assumed primary water search responsibilities immediately and began investigating a 100-mile stretch from the eastern shore of Long Island Sound to Martha’s Vineyard. At 0855 on 17 July, the Coast Guard was advised by the Air Force Rescue Coordination Center that the Air Force had a “last known position” of an aircraft in a casual rate of descent at 2139 on 16 July, 17 miles southwest of Martha’s Vineyard. This new information focused an armada of multiservice, multiagency search assets, both ashore and on the water. By the end of the first day, 6,000 square miles of water along New England’s south coast had been searched. Shoreline searches continued to recover debris identified as having come from JFK Jr.’s plane. Within 18 hours of the crash, local, state, and federal response agencies began congregating at the region’s predesignated maritime disaster command post at Coast Guard Air Station Cape Cod in Bourne, Massachusetts. From that unified command post, the efforts of 26 agencies and more than 50 response platforms were coordinated. This included the location, recovery, and return to shore of the three victims, transportation of family members to and from the USS Briscoe (DD-977) for an at-sea burial, and recovery and return to shore of aircraft N9253. Coast Guard Group Woods Hole was notified at approximately 0215 on 31 October 1999 that EgyptAir Flight 990, bound from JFK Airport to Cairo, with 217 passengers and crew, had disappeared from radar about 60 miles south of Nantucket. Within minutes, phone calls were made to reestablish a unified command post at the Coast Guard Air Base Cape Cod, the same site used for the JFK Jr. recovery. Local and regional resources were mobilized within minutes, and a Coast Guard jet aircraft was on scene within the first hour. Sea conditions were calm and visibility was nearly unlimited as the MV Kings Pointer and the 110-foot Coast Guard cutter Monomoy (WPB-1326) arrived on scene about 0500. Within hours, six aircraft and eight vessels were combing the crash area. After the first day, more than 10,000 square ocean miles had been searched. By 1600 on 31 October, the Newport command post had been established to coordinate the at-sea portion of the response effort. From this location, the activities of more than 50 resources were coordinated, including the mapping of the surrounding ocean bottom, recovery of major pieces of the aircraft, recovery of personal effects and remains, and planning for portions of a globally televised memorial ceremony. The Coast Guard usually is the first federal agency to respond to an on-water disaster and to mobilize secondary command posts. Massachusetts and Rhode Island regional Coast Guard commands had trained and organized for disaster response for several years, focusing on two scenarios, a major oil spill and a ferry disaster involving a large number of victims. Memorandums of understanding (MOUs) had been established with more than 30 agencies to address prevention strategies, individual agency responsibilities , organizational structures, security issues, fire fighting, medical triage and transport, terrorism, and communications, to name a few. Developed from meetings, tabletop exercises, and field training exercises, these preexisting relationships and response protocols enabled a core of familiar faces to form and be effective immediately when a real tragedy occurred. 2. Predesignate and wire unified command posts (UCPs). UCPs for controlling at-sea activities were used in both the JFK Jr. and EgyptAir responses. In each case, a regional Coast Guard command had predesignated UCPs to better coordinate the service’s response to oil spills and already had wired one with telephone lines for communications. The Coast Guard command also had developed a one-page check sheet to evaluate prospective command posts. The predesignation of the UCPs meant that the majority of local and state response agencies knew automatically where to muster to begin making incident action plans. The early establishment of the UCPs also enabled tactical Coast Guard operations centers to maneuver resources without worrying about the media, politicians, or other higher order public safety issues. For example, shortly after the EgyptAir crash, the Coast Guard’s Group Woods Hole Operations Center began receiving media and curiosity inquiries at a rate of 100 calls per hour. Its ability to transfer the majority of this administrative load to alternate command posts within four hours of the crash was critical to the operational effectiveness of the local commands. Although not every calamity can be planned for in a UCP sense, the process of evaluating local high schools, Red Cross shelters, and other prospective sites can help planners bound the problem and come up with reasonable alternatives when time is of the essence. For example, planners have evaluated the Outer Cape Cod area for possible UCP sites for a major ferry mishap and, because of the area’s fragile information technology infrastructure and limited hotel surge capacity, have determined that the best option may be to rely on U.S. Navy or Coast Guard mobile command posts. A secure command post or a site to establish a mobile command post for coordinating on-water rescue and recovery efforts. A secure command post for investigative and reconstructive purposes. During the JFK Jr. case, a building large enough to house the remnants of aircraft N9253 and secure enough to keep out unwanted personnel was constructed inside an aviation hangar at Coast Guard Air Station Cape Cod. During the EgyptAir recovery, Rhode Island Governor Lincoln Almond allowed the use of a large hangar at Quonset Air National Guard Base to reconstruct the aircraft and house the ongoing investigation. A comfortable location for the victims’ families. For the EgyptAir operation, Newport, Rhode Island, 110 miles from the crash site, was chosen because it met the requirements for command posts and had extensive travel– industry services that could accommodate the 250 family members who came from around the globe. A central location to accommodate the media. The media must be kept close to the UCP but at arm’s length. During the JFK Jr. response, they first were situated within 500 feet of the main UCP, but command post personnel initially relied heavily on cellular phone communications and these were thought to have been intercepted by the nearby media. In both responses, the media eventually were housed in gymnasiums-at the Coast Guard Air Station Cape Cod, and Naval Station Newport, Rhode Island-less than half a mile from the at-sea UCPs, which gave key personnel quick access when information needed to be released. 4. Make the Incident Command System (ICS) the common language and architecture of disaster response. Ever wonder how the U.S. Forestry Service can so quickly assimilate and focus the efforts of hundreds of firefighters from many different fire companies from around the country? The answer is 25 years of experience with the ICS. During disaster response, differing agency languages can compound issues tenfold. For example, a chief in the maritime services is a senior enlisted person who coordinates day-to-day tactical activities in a command. Navy and Coast Guard chiefs are overseen in many cases by officers, including lieutenants. A chief in a municipal police or fire department, however, is the head honcho and oversees several lieutenants, his subordinates. The National Interagency Incident Management System ICS protocol provides an expanding disaster response organizational architecture and a common language for all agencies, including municipal fire and police services. The two primary Coast Guard commands that coordinated the JFK Jr. and EgyptAir responses had educated their personnel about ICS and conducted scenario-based exercises with local and state response agencies. During EgyptAir, the Coast Guard set up its at-sea UCP at Pier 2 at Naval Station Newport. After the first three days of search and recovery, the U.S. Navy assumed command of the recovery operation. The transition from Coast Guard to Navy control was delayed because Navy personnel were unfamiliar with ICS, and after a two-day overlap, the ICS organizational structure was converted to the Navy’s familiar N-Staff organization (see figure below). The Coast Guard is pursuing an Incident Management Assist Teams program, wherein Coast Guard personnel with ICS and real disaster experience would provide a surge capability to local commands beginning as soon as 24 hours after a critical event. 3 The Navy recently announced the establishment of regional emergency preparedness liaison officers; these officers can be key advisors on ICS matters when larger Navy staffs are brought in to participate in disaster responses involving civilian response agencies. 5. Prepare to manage offers of technical assistance. From the start of the JFK Jr. search-and-recovery operation, the unified command post was deluged with offers of support from well-meaning, highly regarded technical firms and individuals as well as from unscrupulous vendors and quacks. Offers ranged from unsolicited magnetic imaging analysis to the use of cadaver-sniffing devices more appropriate for urban search and rescue. Command post personnel must have not only good physical security but also a plan to quickly review and legitimize or eliminate offers of technical assistance. In both the JFK Jr. and EgyptAir 990 cases, sophistiGated computer-modeling technologies assisted planners and searchers. For example, NOAA’s office of response and restoration computer models, normally used for oil spill trajectory analysis, were used to “hindcast” the likely JFK Jr. crash location, and to “forecast” the EgyptAir debris field. The hindcast model took the time of recovery, geographic position, and surface area of recovered materials from the JFK Jr. aircraft and ran 4,000 simulations of each article’s track in reverse. Using the area’s historic currents and observed winds and knowing the approximate crash time, NOAA scientists generated a plot of the likely crash location. This was available days before FAA composite radar-tracking information. In fact, the plane was located just 1.45 nautical miles from the center of the area of probable location. During EgyptAir, harsh New England weather, including sea heights to 20+ feet, hampered on-site debris recovery and bottom side-scan sonar search operations. NOAA’s forecast model enabled planners to predict where fields of debris would migrate during recovery stoppages. This information was used to direct and position recovery platforms during subsequent fair weather operational windows, In addition, because it was not known during the search phase whether the aircraft broke apart in mid-air and was widely dispersed, NOAA’s models also were used to investigate reports such as observed oil slicks near the search area. 6. Monitor fatigue. By happenstance, one local Coast Guard command’s key operations center (OpCen) personnel were wearing specialized sleep and activity monitoring devices during the response to EgyptAir 990. Analysis of their sleep and activity data showed that Coast Guard personnel who stood frequent 24-hour watches often suffered acute periods of suboptimal performance because they were unable to sleep for any period of time. During events such as EgyptAir, responders push themselves well beyond normal physical and mental limits. The study also concluded that “OPCEN personnel routinely operate in or near their personal ‘Red Zones’ during high tempo periods.” 4 The red zone indicates exposure to sleep/work cycles that induce chronic fatigue. 7. Manage the media. 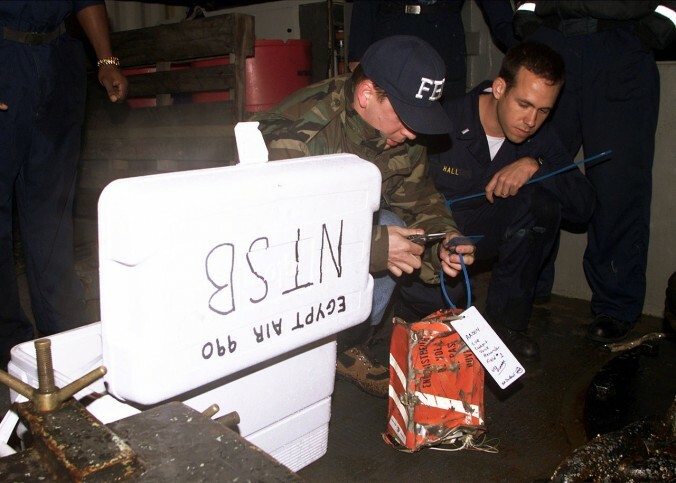 The Coast Guard and other participating agencies were in the limelight during the JFK Jr. search-and-recovery operation. Even the Martha’s Vineyard Times, a small local newspaper with a web site, received 160,000 messages of condolence from people across the globe. During the JFK Jr. response, the predesignated media center was too close to the unified command post, allowing the media to monitor key personnel’s movements easily and to intercept cellular phone communications. After relocating the press to a nearby gymnasium and beefing up physical security, these issues quickly became moot. 9. Manage the mental health needs of rescuers. Rescuers, support personnel, and their families can be victims, too, and they need access to follow-up mental health care well after an event. The Coast Guard and several other agencies, including a dedicated chaplain corps, assisted crews who had the grim task of recovering human remains and personal effects during both tragedies. In the EgyptAir operation, several personnel were affected by the recovery of personal effects, especially those obviously from children. 10. Compile lessons learned and pass them on. Coast Guard local, regional, and national units worked hard compiling the lessons learned from New England’s 1999 tragedies. This information was chronicled in a Coast Guard-wide database and shared among local and state emergency management agencies. The New England commands also were able to route their lessons learned to California units responding to the January 2000 Alaska Air Flight 261 tragedy. The Coast Guard commands involved in these two rescue-and-recovery events did not have specific contingency plans for airplane crashes, nor do they need them. Clearly, the preexisting relationships among emergency– response agencies and the predesignation of unified command posts were the two most critical elements of the service’s success. Its leaders’ focus before the tragedies on readiness for a number of much more probable events, like oil spills and ferry disasters, built a cohesive core of responders who knew their roles and capabilities immediately. Hopefully, the lessons learned from the JFK Jr. and EgyptAir tragedies will help others better prepare for the next calamity we all pray never occurs.